This January we are joining forces again with our good friends @ Volunteer Centre Camden this time in the heart of King’s Cross at Voluntary Action Islington, Pentonville Road, N1 9JP on Thursday 31st January 2019, 12-2pm. 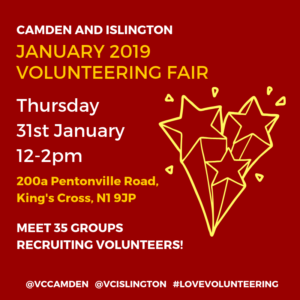 Join 35 local organisations that are looking to recruit volunteers for volunteering roles in Islington, Camden and a bit beyond at our Winter 2019 Volunteering Fair. If your organisation wants to recruit volunteers in Islington or Camden at the fair, then book your free place via eventbrite. There’s space for 35 organisations, but you’ll need to be quick as the places are going quickly!!! As always, there’s no need to book. Just pop in. We look forward to seeing you there.